The 2018 Derby begins at 12:01 a.m. on Sunday, September 9, 2018 and ends at 10:00 p.m. on Saturday, October 13, 2018. 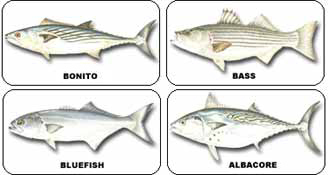 Eligible fish are Striped Bass, Bluefish, Bonito and False Albacore (Little Tunny), hereinafter referred to as the species. An individual may register only once in each division for which he/she is eligible. The All Tackle Division is open to adults using any type of rod and reel including fly rod. Persons who have reached their 65th birthday on or before the opening day of the Derby will be registered as Seniors. The Junior Division is open to persons aged 9-14 on the opening day of the Derby. Juniors may use any type of rod and reel including fly rod. The Junior Division will follow the rules of the All Tackle Division. The Mini Junior Division is open to persons aged 4-8 on the opening day of the Derby. Mini Juniors may use any type of rod and reel including fly rod. The Mini Junior Division will follow the rules of the All Tackle Division. The M.V. Striped Bass and Bluefish Derby Committee strongly discourages parents from taking children out of school to go fishing. For many years we have had an unwritten rule that no student may fish during school hours. It is unsportmanlike to do so when all other students are attending school. We expect all parents to enforce this commitment to education and to good sportsmanship. The Fly rod Division is open only to persons using fly rods. Fly rod Division competitors will be issued a separate Fly rod badge and number and will fish under the rules of this Derby. The official Derby rules specific to fly fishing consist of IGFA modified rules and are located on the Derby website at mvderby.com. If a Fly rod competitor is also entered in one of the All Tackle Divisions, he/she may enter his/her fish as All Tackle. The decision to enter a fish in either division (but not both) must be announced to the Weigh-Master PRIOR TO THE WEIGHING OF THAT FISH. That fish is then eligible for the Grand and Grand Slam Awards, regardless of the division it is entered in. Juniors fishing in the Fly rod Division will be considered as adults. PAYMENT OF ENTRY FEES: Payment of Entry Fees may be by cash or personal check. There will be a $25.00 service charge for returned checks which, along with the Entry Fee must be paid in cash. Failure to do so will disqualify the entrant from further participation in the Derby and forfeiture of any prizes. A Competitor must be registered in the Derby BEFORE commencing to fish. From the moment a fish strikes or takes a bait or lure, the angler must hook, fight and land or boat the fish without the aid of any other person except that another person may grasp the leader in order to gaff or net the fish. This includes another angler touching the rod, reel or line after the fish has been hooked. The only exception is another person may grasp the leader in order to gaff or net the fish. This includes both Mini Junior and Junior anglers. The use of drones for the purposes of locating or catching fish or to gain a competitive advantage is prohibited during the Derby. SHORE: All fish entered as shore fish must be caught from the shores of Martha’s Vineyard or Chappaquiddick Islands. Fish caught from rafted boats along Memorial Wharf in Edgartown, accessible by the general public, will be considered shore fish. BOAT: Fish caught from a private boat anchored to the shore or tied to a dock will be considered boat fish. In the event that there is a question as to whether or not a fish is to be considered a boat or shore fish, the Derby Committee will determine the category and that decision will be final. All fish entered as boat fish must be caught from a boat which is within the posted bounds of the Derby. The bounds are delineated on the map in the Rules Brochure (download here). An eligible fish must not be transported outside of Derby boundaries. No fish caught from a boat may touch any land except for Martha's Vineyard. eg. - Fish caught from a boat tied to Oak Bluffs Steamship Pier will be considered a Boat Fish. eg. - Edgartown Water Barge is considered a boat. All state and federal laws must be complied with by participants in the Derby. The Weigh-In station for all fish entered in the Derby will be at Edgartown Jr. Yacht Club. The weigh-in periods will be between 8:00 - 10:00 a.m. and 8:00 - 10:00 p.m. on each day of the Derby. All fish must be weighed-in within 14 hours from the time of being caught. Fishing method known as yo-yoing is not permitted in the Derby. Any fish that is physically altered or intentionally mutilated in such a manner as to impact the ability of the Derby committee to determine eligibility of that fish shall be rejected except that normal routine bleeding of a fish, but not gutting, shall be allowed. Fish may not be weighed in that were intentionally snagged. 's mouth shall be removed by the angler (or person(s) weighing the fish in) PRIOR to weigh-in. If any such material is not visible to the angler or person(s) weighing the fish in and is discovered after weigh-in, this material shall be examined by the Derby Committee and, if deemed to be inside the fish prior to it being caught, the weight of such material(s) may be deducted from the official weight of the fish, and the fish allowed. If, however, the Derby Committee deems that the material was intentionally introduced to the fish prior to the weighing in of that fish, additional action may be taken including, but not limited to, the disqualification of the fish, the angler, and/or the person(s) weighing in the fish. Measure from tip of lower jaw to tip of tail. At time of weigh-in the angler must present his/her badge or card and provide the Weigh-Master with full and certified information as to when and where the fish was caught, the type of tackle, lure or bait used, and any other requested information relating to the catch. The angler must declare the division into which the fish is to be entered prior to the weighing of each fish. By signing the weigh-in slip, the angler attests to all information given. An angler may enter only his/her largest fish of each species into each category (boat or shore) on any one day. At time of weigh-in the Weigh-Master and/or the Derby Committee reserve the right to inspect, test, open, photograph (for publicity reasons and otherwise), hold or reject any fish entered. First, second, third and fourth prizes will be awarded on a daily basis for each species, division and category, except False Albacore (Little Tunny).During the run of the Derby an angler may win only one first, one second, one third and one fourth daily prize for each species, category and division. If an angler qualifies for a prize he has already won, he/she will be awarded the highest prize for which he/she is eligible. Other winners that day, in order of their eligibility, will be adjusted to receive prizes left vacant. A Hat Trick will be awarded to an angler who wins first, second, third, and fourth Daily Prizes in a category. A special pin will be awarded for this achievement. 1 per person, per species. Weekly awards will be given to the largest fish in each category of each division and species, including False Albacore (Little Tunny), for each week of the Derby. The weeks end after the last weigh-in on each of the following days: (Saturday, September 15; Saturday, September 22; Saturday, September 29; Saturday, October 6; Saturday, October 13). At the end of the Derby, overall prizes will be awarded for the three largest fish in each category of each division and species, including False Albacore (Little Tunny).The largest fish of each species from boat and shore, regardless of division, will also be awarded the Grand Leader Prize for the category and species. Winners of the species grand prizes will also receive their divisional grand prizes. This category is open to all divisions. There will be separate awards for All Tackle and Fly rod Divisions. At the end of the Derby, first, second and third awards, both boat and shore, in both divisions, will be made to the angler who weighs-in the heaviest aggregate (total weight) of the four species of fish in the tournament – Stripe Bass, Bluefish, Bonito and False Albacore. Anglers who achieve a Grand Slam will be awarded a special pin. Awarded to the individual who wins the highest number of Daily pins in the All Tackle Division by the close of the Derby. Separate awards for Boat and Shore categories, Junior and Mini Junior Divisions. False Albacore (Little Tunny) are eligible for weekly, overall, grand and grand slam awards. They are not eligible for daily awards. False Albacore length limit is 25”. Only three False Albacore are allowed per registration during the Derby. This includes any False Albacore presented to the Weigh- Master, even fish under 25”. The first registered fish wins. Grand prize winners are responsible for all applicable taxes and fees. Prizes not claimed from the Derby Chairperson, including grand prizes, by December 31, will be forfeited. Each contestant expressly agrees that he/she shall have no right or standing to contest any action of the Derby Committee, or otherwise make any claim against the Committee in any court of law or other forum. Each contestant entering the Derby does so at his own risk. The Committee’s decisions are definitive and final. Grievances must be presented, in writing and signed, to The Weigh-Master and/or to the Committee within 48 hours. The Committee will investigate all grievances and reserves the right to call witnesses, to question them and all parties involved, and if considered necessary, to have any or all involved parties submit a polygraph test. The Committee may disqualify from the Derby (or any portion thereof) and/or from any or all future Derbies, any person or persons who falsify information, violate the Derby Rules, act in an unsportsmanlike manner, or falsely testify for or against any person. The fillet program is offered by the Derby to provide free fish for the Island elderly. Fishermen may donate any or all of their catch to this program. Previously filleted fish will not be accepted. Fishermen are asked to keep their catch as fresh as possible whether they intend to donate it to this program or not. In return for the generosity of property owners, it is expected that Derby participants will leave all land and beach in the same conditions, or better than those found. No gates be left open. No rubbish or refuse be left on land or beaches. No camping be done nor any fires lighted without proper authority. No damage to dunes or dune vegetation be done by over-sand vehicles. Drive your vehicles only on designated paths throughout the dunes. Download a pdf of the 2018 Derby Rule Book.